Today was the second day of this year's EISCAT_3D User Meeting, with many good and interesting presentations covering a large range of applications. You can find the programme of the meeting on-line, and also most, if not all of the presentations will eventually be made available on the EISCAT_3D project web site. During the day, proceedings were broadcast live on the EISCAT_3D Twitter feed, which one can follow even without having to register a Twitter account. Altogether there have been three talks discussing the connections between LOFAR and EISCAT_3D. LOFAR is a large radio astronomy receiver array, whose operational frequencies cover the anticipated EISCAT_3D frequency of 233 MHz. Richard Fallows, who is now with ASTRON, showed results of simultaneous Interplanetary Scintillation measurements from pairs of LOFAR sites and from the EISCAT UHF sites at Kiruna and Sodankylä. The solar wind velocities obtained from all site-pairs agree to within about 1%! Juha Vierinen, of SGO/U Oulu, discussed the plans for KAIRA, which is the Kilpisjärvi Atmospheric Imaging Receiver Array. KAIRA is built using LOFAR receiver hardware in order to do EISCAT_3D prototyping by receiving signals from the EISCAT VHF radar about 85 km away in Tromsø. 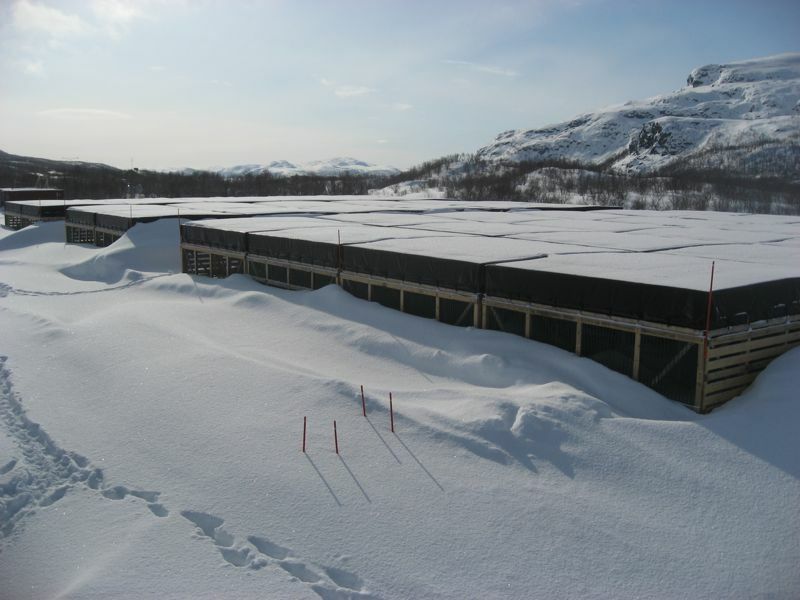 Juha Vierinen was happy to tell that the "snow removal by wind" worked very well during the past winter, which is due to the HBA tiles being deployed on platforms as seen in the photo. The High-Band Array (HBA) has been deployed in 2011, but without the summators, which are taking care of per-tile beam-forming. These will be installed in week 23, so that test measurements can begin. Furthermore, the colleagues from Sodankylä will deploy a 48-antenna LBA array this summer at Kilpisjärvi, which will have a large number of applications including, e.g., use as imaging multi-frequency riometer. In the afternoon, we heard reports from supporting actions in Norway and Sweden from Cesar La Hoz and Jörg Gumbel, respectively. The good news is that in the Nordic Countries, significant funds are being earmarked for infrastructure development, potentially large parts of which could go to EISCAT_3D. However, it was made very clear, that these funds will be made available through competitive, national application processes and decisions will be made on the basis of scientific merit. Deadlines for application are different from country to country, and the closest is already in October 2012 in Norway, i.e. in only five months time! Later on, EISCAT Director Esa Turunen introduced the meeting participants to the EISCAT_3D site selection process. He showed maps computed by Mikko Orispää using a software by Ilkka Virtanen. This software allows for comprehensive modelling of EISCAT_3D based upon given parameters such as beam width, transmit power, number of aerials, number of remote sites, location of remote sites and many more. He reported that four possible sites have been surveyed as part of the FP6 Design Study, and a number of further sites were surveyed in 2011. Four or so more sites will be surveyed in the summer ahead. At the moment, the current view is that the central EISCAT_3D site will be within a 50-km circle around the location where the national borders of Norway, Finland, and Sweden meet. Effectively it seems likely that the central site might be placed between Skibotn and Kilpisjärvi. Finally, the newly appointed EISCAT_3D Technical Expert, Björn Gustavsson, introduced the current status of the performance specification to the audience. While a lot of this is still under discussion, some key components were mentioned. The facility is likely to comprise a core site with three to six remote sites. At this stage it is not excluded that some of these might be active, too, or are at least upgradable. The centre frequency is anticipated to be near 233 MHz and the transmitter peak power should be ≈10 MW. There'll be several outlier antenna groups around the central site for in-beam interferometry (note, these will be much closer than the remote sites). The radar should have arbitrary phase, power and polarisation. Various layouts of aerials within one site as well as layouts of central and remote sites are being investigated. There was a discussion on the advantages and disadvantages of having a central site, which is a combined transmit/receive site as opposed to what is called a "locally bistatic" site, i.e. a site that consist of distinct transmit and receive arrays. Markku Lehtinen (SGO/U Oulu), who could not attend the meeting, had sent some slides showing a back-of-the-envelope estimate, which indicated, that separated transmitter and receiver might well be advantageous and deliver a better performance given the same budget. This is because transmitter antennae need to function well only over a narrow frequency bandwidth while receiver antennae need to perform well over a much larger bandwidth in order to measure plasma lines. On the other hand, the transmitter antennae need to be sturdier than the receiver aerials. Due to separation of transmitter and receiver, a transmit-receive switch won't be necessary. All of this needs further investigations of the trade-offs performance-wise as well as financially. During the discussion session, which concluded the day, Esa Turunen asked the audience whether anything crucial was overlooked, and, since EISCAT_3D will first of all be a science facility, is there something, that needs to be made possible, but hasn't been accommodated so far. Thus now it is time to get in touch and send your comments!